"Pippin saw his carven face with its proud bones and skin like ivory, and the long curved nose between the dark deep eyes; and he was reminded not so much of Boromir as of Aragorn." Decorate your space with this lovely curtain, and remember Lothlórien every day! A plain-coloured curtain – preferably beige, light blue or light green, but most light-coloured curtains will do. Brown, deep red or dark green velvet or velvet-like fabric (this is not too expensive. I got 30cm x 200cm for around £3). The fabric I used is actually green, although it doesn’t look like that from the picture. Silver thread. It shouldn’t be too thick or else it will be hard to sew with. * Make a pattern of a leaf shape. I based my design on a white poplar leaf because I thought that looked right. It should be a decent size. * Cut out as many leaves as you can out of the fabric. * Arrange the cutout leaves onto the curtain randomly. It is good to use a random pattern so it looks like leaves falling. To help keep the leaves in place after you have arranged them tack (pin) them, or use a bit of tacky glue to hold them. * Use the silver thread to sew the leaves onto the curtain. * When you sew the leaves on, use the silver thread in a vein-like pattern on the leaf. This should be enough to keep it on and it makes it look more artistic. An embroidery frame is useful for this. * Iron the curtain to remove any creases. Low heat is recommended on the velvet, or use a thin piece of cotton between the velvet and the iron. * Make two different shapes of leaves and sew them on to create a different look. * Use different colours for the leaves for an autumn look. 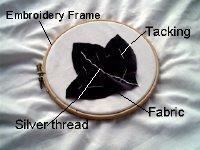 * Using the silver thread, embroider a stalk as well. * Change the designs a bit to look like the brooches the fellowship were given by Galadriel in Lothlórien. 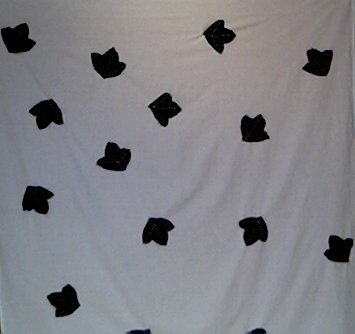 * To represent leaves that are falling, put lots of leaves close together near the top right hand corner of the curtain and then sew them on farther apart as they go down.